On Sale Now! Free Shipping Included! 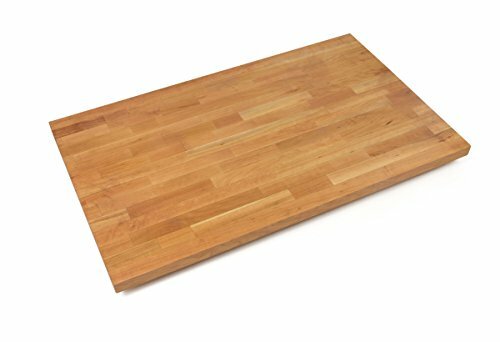 Save 10% on the John Boos CHYKCT-BL3627-V Blended Cherry Counter Top with Varnique Finish, 1.5'' Thickness, 36'' x 27'' by John Boos at Sara Stage. MPN: CHYKCT-BL3627-V. Hurry! Limited time offer. Offer valid only while supplies last. This John Boos Blended Cherry Kitchen Counter Top is both attractive and functional, providing a tough duty cutting surface everywhere you need it. This John Boos Blended Cherry Kitchen Counter Top is both attractive and functional, providing a tough duty cutting surface everywhere you need it. This cherry top is finished with a virtually maintenance free semi-gloss Varnique finish. The Varnique finish is impervious to most household chemicals, cleans easily with mild soap and water and does not require regular oiling. It is not designed to be a cutting surface (opt for the penetrating oil finish countertops if you want to use the counter as a direct cutting surface), and cuts in the finish should be sealed immediately to prevent exposed wood from absorbing moisture. These beautiful blended cherry countertops are Made in the USA by skilled craftspeople. These richly-colored countertops are designed to enhance and compliment any style of kitchen design/décor. These highly functional countertops are easy- care alternatives to granite or stone counters, and can be used as a food prep and cutting surface. Each countertop is constructed with full length exterior rails and random finger-jointed interior rails. During installation, please note that an overhang of 8 inches or more (width), and 12 inches or more (length) must be stabilized with support. Publisher: John Boos & Co. Studio: John Boos & Co.
Kobi Blocks Maple Edge Grain Butcher Block Wood Cutting Board 20"X26"X1.5"
John Boos & Co. Reversible Walnut Cutting Board SLTWAL211715-O3 , 21"x17"